A CHARITY working to support adults with learning disabilities is calling on the public’s help to raise donations for a gardening van. The Apuldram Centre in Chichester is looking to buy a van which costs round £21,000 and has already obtained half of the cost. During the grass growing season, the Apuldram Centre runs a thriving contract gardening service. 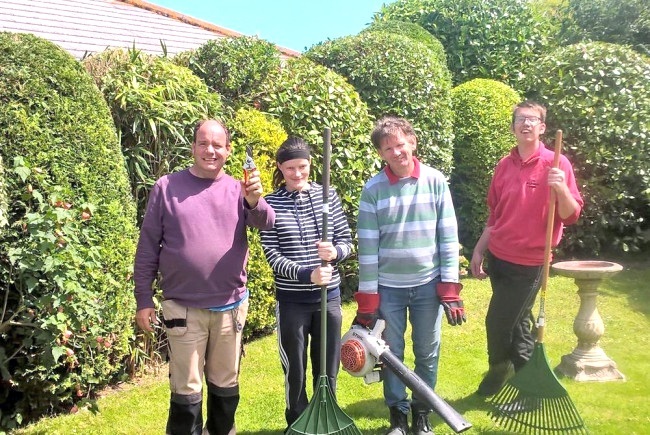 Adults with learning disabilities taking part in this activity will mow lawns and undertake basic gardening tasks for the public in the local community. This service not only provides the gardening customers with good value, it also provides an essential opportunity for the people the charity supports to gain confidence and vital work skills, which may help them to go onto gain future employment. They will engage in activities that directly link to maintaining and sustaining independence and be more equipped and skilled to move onto volunteering or work opportunities. A new van, and therefore the expansion of the service, will enable new opportunities for the wider community to integrate with The Apuldram Centre and to demonstrate and celebrate ability rather than disability and disadvantage. Rachel Aslet-Clark, Apuldram’s general manager, said: “We are pitching to West Sussex County Council’s community initiative fund for £5,000 towards a new contract gardening van and we have to do this via a crowd-funding site called Spacehive. The county council make its decisions on February 5, so the centre is urgently asking people to make a pledge and share with others. Please visit our crowd-funding page by going to https://www.spacehive.com/apuldram where you can read more about the project, the funding required and make a donation pledge.